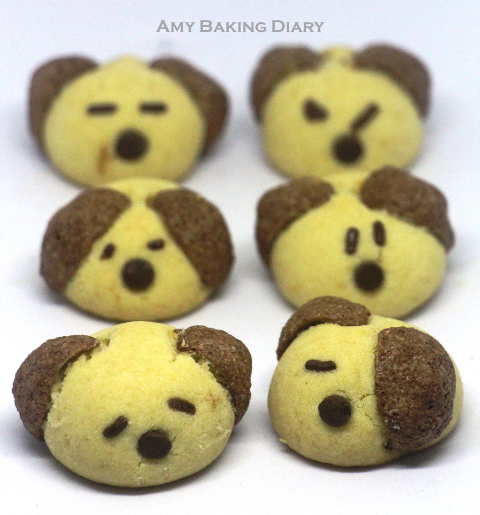 2018 is a year of dog and you can find these doggie cookies are all over the FB. 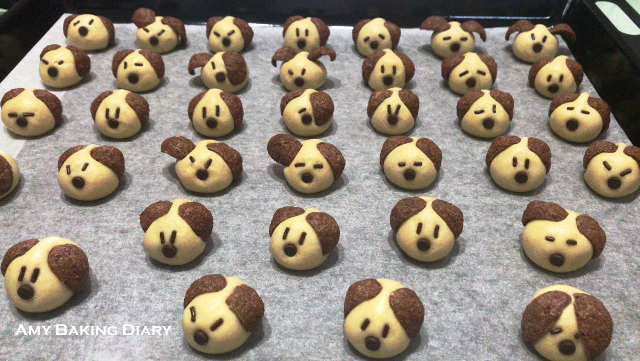 They are so adorable that I told myself I would't want to miss baking them. So I decided to do the Horlicks flavor instead of pineapple filling. I enjoyed making these doggies so much. It’s so fun. My favourite part is putting every dog with different expression and from each pair of their eyes and also the position of their ears, you can easily describe their mood. This recipe is adapted from Veronica’s blogs, Peng’s Kitchen. Happy Chinese New Year Baking! 1)Sift the flour, cornflour and milk powder. 2)Cream the butter and Horlicks for 3 minutes at low speed. Do not overbeat. 3)Add the sifted flour and beat for about one minute to form a dough. 4)Divide dough into 10g each. Embed 3 chocolate chips into each piece of dough and roll into a ball. 5)Insert 2 pieces of Koko Krunch to form the ears, chocolate rice as eyes and 1 chocolate chip as the nose. 6)Bake at 160 deg c for about 20 minutes. Cool before storing.